Unfortunately, our NGO Site Tours have sold out and are no longer available with registrations. We wanted guests at the Pathways to Resilience conference to be able to learn a bit more about the incredible work that some Non-Governmental Organizations (NGO) are doing in South Africa. While there are a number of different NGOs doing amazing work, we have chosen to highlight the Etafeni Day Care Centre Trust, Community Action for a Safer Environment (CASE) and the Desmond Tutu Foundation Youth Centre. Visits to these sites will happen on Tuesday, June 13th, 2017. All buses will be leaving from Century City Conference Centre at 12:15pm SAST. The Etafeni Centre has developed a replicable model of holistic sustainable community-based care for AIDS-affected and vulnerable children and their caregivers. It is situated in Nyanga, one of the oldest black townships in Cape Town. As an impoverished community, the people of Nyanga face severe unemployment and alarming rates of HIV/AIDS. Once known as having the highest crime rate in Cape Town, Nyanga is slowly improving through the efforts of community members who are working hard to alleviate poverty and create job opportunities. You are invited to meet the youth involved in Etafeni’s Fit for Life, Fit for Work program, After School program, and the women of the Income Generation craft centre. Three small shuttle buses will take 36 people to Etafeni in Nyanga for an afternoon’s visit to have a simple, traditional lunch with the people of the centre, learn of the Etafeni program, a conversation with the youth, children and women involved, and a stop at the centre’s craft shop. Nyanga is a township that is 30 minutes’ drive from the city centre. Cost: $25 CAD (R350) per visitor. Please note that that since we are a year out from the tours, and the highly volatile fuel market there is a slight chance prices may change closer to date. Started by one of our Hot Topic Debate speakers, Lane Benjamin, CASE seeks to break the cycle of crime and violence in which young people live by equipping community members to reorganize and respond appropriately to both the causes and effects of crime and violence in their community. It is based in Hanover Park, a neighbourhood developed to enable the Apartheid policies of segregation, situated 20 minutes out of Cape Town with high levels of unemployment, gang activity and substance dependence. Based within a series of converted shipping containers on the grounds of a local High School, CASE runs after school and youth programs, men’s groups, support groups, women’s wellness activities using counselling, life skills and group support to create a positive community. You are invited to meet the community members involved in CASE’s program. One small shuttle bus will take 12 people to CASE in Hanover Park for an afternoon’s visit. The Desmond Tutu HIV Foundation has worked in Masiphumelele, an under-resourced community south of Cape Town, for more than twelve years. The Youth Centre is a project that grew from this relationship in response to the needs of young people in the area. The goal is to give adolescents the tools and the confidence to make healthy life choices and to assist them in developing their potential. The Youth Centre does this through offering a safe, healthy environment where youth aged 12-22 from diverse communities can gather, learn, and play and access friendly sexual and reproductive health care. The project is housed within the Desmond Tutu HIV Centre at the Faculty of Health Sciences, University of Cape Town, which is an accredited research grouping with the purpose to lessen the impact of the HIV epidemic on individuals, families and communities, through innovation and is committed to the pursuit of excellence in research, treatment, training and prevention of HIV and related infections in Southern Africa. You are invited to meet the staff and youth of the centre. One small shuttle bus will take 12 people from Century City to the Youth Centre for an afternoon's visit. The hours’ drive to Masipumelele is particularly scenic moving from the city along the Atlantic seaboard, Hout Bay, and Chapman’s Peak. Keeping the time of day in mind the shuttle will stop briefly at the Fisherman's Wharf in Hout Bay where attendees can purchase a lunch. Alternatively, attendees are welcome to bring a snack or lunch with them as well. The shuttle bus will return on the southerly side of the mountain. Please note that the costs cover a donation of $10 CAD (R120) per person to the host organization. The remainder of the charges are at a cost recovery basis to cover the cost of transportation to and from the site. Cape Town International Airport (CPT airport code) is the main airport servicing the city of Cape Town, it is the second busiest airport in South Africa and the third busiest in Africa. The airport is located approximately 20 kilometres from Century City Conference Centre. The airport has domestic and international flights. In general most airlines use Johannesburg as their hub airport and will require a connecting flight. A word of caution, when booking flights please allow time for clearing customs and immigration in Johannesburg, depending on the time of day and arrival of flights this can take quite a bit of time. Letters of Invitation to the Conference - A letter of invitation is issued solely for the purpose of assisting participants with visa applications and/or to obtain funding for their attendance at the conference. Such a letter does not imply any financial obligation on the part of the conference organizers. If you require a letter of invitation, please check off the box requesting a letter in the registrations form. Please note that your registration must be complete and paid in full before an invitation letter will be issued. Please visit the Department of Home Affairs, Republic of South Africa website at http://www.dha.gov.za/ to determine if you will require a visa to enter South Africa. Please note that it can take up to 90 days for a visa to be processed. Therefore, we will not be issuing Letters of Invitation after March 15th, 2017. If you apply for a visa before March 15th, 2017 and your entry is denied, we will refund your full registration fee amount. If you chose to apply for a visa after the March 15th, 2017 deadline and your entry is denied or your visa does not get processed in time, we will not refund your registration fee. If you have in your possession any prohibited/restricted goods and/or goods which fall outside your duty-free allowance, or if you are unsure whether any goods in your possession fall within these categories, please proceed to the Red Channel. Currency: South African bank notes in excess of R25 000, gold coins, coin and stamp collections and unprocessed gold. Endangered plants and animals: Species of plants or animals that are listed as endangered, whether they are alive or dead. The restriction includes any parts of or articles made from them. Food, plants, animals and biological goods: All plants and plant products, such as seeds, flowers, fruit, honey, margarine and vegetable oils. All animals, birds, poultry and products thereof, for example, dairy products, butter and eggs. Medicines: Travellers are allowed to bring in no more than three months’ supply of pharmaceutical drugs and medicines for their personal use. All other pharmaceutical drugs and medicines have to be declared and have to be accompanied by a letter or certified prescription from a registered physician. If you have something to declare, your Traveller Card and passport are scanned and you make a verbal declaration, which is captured on the system by a Customs officer. This information forms the basis of a Traveller Declaration form (TRD1). The TRD1 will also be used as a Temporary Import Permit (TIP) and Temporary Export Permit (TXP). If the traveller is happy with the information on the TRD1, they are asked to sign on an electronic signature pad and their signature is captured on the system. The signed TRD1 is then printed and given to the traveller. If the goods in your possession fall within your duty-free allowance, you do not have any prohibited or restricted goods in your possession, you are not in possession of any commercial goods (imported for trade purposes) and you are not in possession of gifts, carried on behalf of others, please proceed to the Green Channel, unless instructed otherwise by a Customs Official. You may be stopped, questioned or searched by a Customs Officer at any time in the Red or Green channel. In addition to personal effects and the above consumable allowances, travellers are allowed new or used goods in accompanied baggage to the value of R5 000. A traveller is entitled to these allowances once per person during a period of 30 days after an absence of 48 hours from South Africa. The tobacco and alcohol allowance is not applicable to persons under the age of 18 years. Can I bring personal medication under the duty-free allowance? Travellers may import their personal medicaments provided it is for not more than three (3) months’ use. This must be accompanied by a prescription issued by a medical doctor. By far, the most accepted cards are VISA and MasterCard. American Express and Diners Club cards have global networks but acceptance can vary. Cape Town is renowned for having all four seasons in one day. February is the hottest month in Cape Town with an average temperature of 23°C (73°F) and the coldest is June at 13°C (55°F). The wettest month is July with an average of 100mm of rain. Go to www.accuweather.com for full forecast of weather. The mobile network code (leaving out the first zero), if you're calling a cellular/mobile network. So, for example, to phone South African Airways' call centre from abroad, you'd dial +27 11 978 5313 (Johannesburg's area code is 011, but if you're phoning from abroad, you drop the zero). Cape Town, or more commonly known as the Mother City, is a coastal city in South Africa and is also the provincial capital. The city is famous for its harbour and its natural setting in the Cape Floristic Region; as well as for it's landmarks such as Table Mountain, Cape Point, Robben Island (The notorious prison that once held Nelson Mandela is now a living museum). It is one of the most multicultural cities in the world. Located on the shore of Table Bay, Cape Town was first developed by the Dutch East India Company as a supply station for Dutch ships sailing to East Africa, India, and the Far East. Top 6 Things to See in Cape Town! Table Mountain is about a 40-minute drive away from Century City and definitely the place for hiking, biking, or walking in Cape Town while at the Conference. 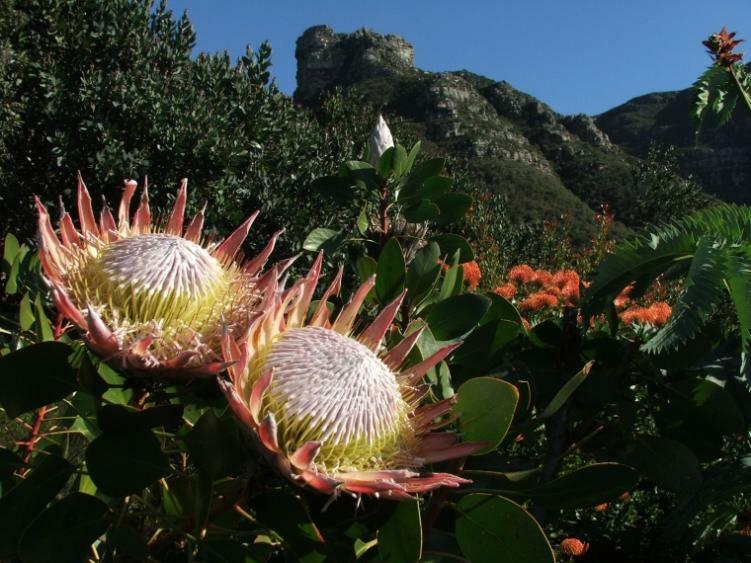 Table Mountain has withstood over six million years of erosion and hosts the richest, yet smallest floral kingdom on earth with over 1,470 floral species as well as numerous rare and endangered species. To buy tickets for the Table Mountain Aerial Cableway go online to www.tablemountain.net. Buy your tickets online before you arrive and remember that you will still need to queue for the Cableway on busy days. Cableway tickets are only valid if purchased via Webtickets. Online tickets can be purchased and printed from any computer, or shown on-screen on a mobile device. Tickets are also available from the Ticket Office at the Lower Cableway Station. Robben Island was the prison where former President of South Africa Nelson Mandela served 18 out of his 27 years behind bars. It is both a South African National Heritage Site as well as a UNESCO World Heritage Site. Located 20 minutes North of Century City, Robben Island hosts museum tours that are about 3.5 hours long including the ferry trip to and from the island. The tour guides inside the prison are former political prisoners. Passengers should arrive no later than 30 minutes prior to the scheduled times of departure, boarding gates close 10 minutes before departure time. For more info go to www.robben-island.org.za. Venue B (Old Mutual Conference and Exhibition Centre) is located at the Kirstenbosch Gardens. Be sure to put some time aside to explore the 36-hectare garden that was the first garden in the world to be devoted to a country’s indigenous flora. The Hop On – Hop Off bus tour also stops at the gardens. Go to www.citysightseeing.co.za for prices, timetable and to book tickets. Even though Kruger National Park is well known for its safari expeditions, it is located 17 hours away from Cape Town and you might not be able to fit that into your busy schedule! However, Big 5 Private Game Reserve is located less than 2 hours away from Century City, and provides day trip safaris, as well as horseback safaris, quadbike (ATV) safaris and overnight safaris! See if you can spot all 5 of Africa’s wildlife legends: elephant, lion, buffalo, rhino, and leopard. Wine tours, which include wine tastings, cheese tastings, cellar tours, and restaurant lunches depart Cape Town daily and provide information on the many different wines that Cape Town produces as well as stunning scenery. It is a great way to spend an afternoon, or a whole day if you prefer! Pick-up and drop-off locations include certain hotels in Cape Town, so be sure to go online and see if your hotel is on the list. Boulders Beach is part of Table Mountain National Park and is home to a breeding colony of over 2000 endangered African Penguins. Located an hour South of Century City, the beach is seldom crowded and small rock pools and bays keep the ocean in the area warm and gentle. Canal Walk, which boasts 400 shops, restaurants and services, is the 3rd largest shopping centre in Africa. The Canal Walk Shopping Centre is located at Century City. Canal Walk's international, national and local visitors are provided the highest level of service from its world-class Visitor Information Centre, offering everything from travel bookings to gift card sales. The convenience continues on every level with extended trading hours from 9am to 9pm every day and easy access directly from the N1 Highway. Canal Walk merges the world's most desirable brands with shopping convenience and entertainment with everyday leisure, all in an inspiring setting. Greenmarket Square is a historical square in the centre of old Cape Town, South Africa. The square was built in 1696. Over the years, it has served as a slave market, a vegetable market, a parking lot and more recently, an informal flea market trading mainly African souvenirs, crafts and curios. Mondays to Saturdays, between 09h00 and 16h00, it’s just the place to find clothing, glassware, hand-painted fabrics, footwear, music, sunglasses and curios from all over Cape Town and Africa. Multiple eateries flank the square. At Out of Africa V&A Waterfront you can buy traditional and contemporary goods, that have been carefully crafted from stone, wood, bark, beads and clay. A large number of the products are produced and purchased from community programmes dedicated to social upliftment and job creation, sustaining over 30 000 people from marginalised, rural communities. For more tourism information, visit the Cape Town Travel website! Transportation between the two conference venues is not included in your registration fees. Attendees are responsible for arranging their own transportation. Please keep in mind when moving between hotels and the conference venues to make sure to allow for adequate travel time (Venue B: Kirstenbosch is roughly a 30 minute drive away from Venue A: Century City). Here is a list of different services that offer transportation. Please remember to contact the hotels directly to book a shuttle. The same shuttles can also be booked to travel to Venue B for the third day of the conference. Note that all prices are subject to change at the discretion of the hotels. Use the Uber app on your cellphone or go online at https://www.uber.com/cities/cape-town to order a taxi while in Capetown. Please note this is not the advised method to travel to and from the airport. We suggest booking a private taxi or calling a hotel shuttle when travelling to Century City from the airport. All conference venues are well serviced by the various modes of public transport. Century City can be accessed by a primary public transport interchange which operates off Ratanga Road and a second off Century Avenue. Both have designated lanes for minibus taxis and MyCiti Busses and a terminus building with public toilets, waiting areas, public telephones, a ticket office and vending machines. Commuter buses and minibus taxis are not permitted on the Century City road network and their operations are restricted to the transport interchanges. MyCiTi is a high-quality bus-based transit system that delivers fast, comfortable, and cost-effective urban mobility with segregated right-of-way infrastructure, rapid and frequent operations, and excellence in marketing and customer service. This is a concept known as Bus Rapid Transit (BRT). BRT has virtually all the performance and comfort of a modern rail-based transit system but at a fraction of the cost – typically four to 20 times less than a tram or light rail transit system and 10 to 100 times less than a rail system. The central defining feature of BRT is its focus on customer service. Dedicated, median busways provide customers with dramatically reduced travel times. Because the vehicles move quickly in peak hour, more people are encouraged to switch from private car use to public transport, which makes the whole system far more viable. The dedicated lanes also reduce operating costs so that fare levels are quite affordable. Special attention is also given to safety and security through the presence of extensive security personnel and the use of CCTV cameras. Everyone over four years needs a myconnect card to travel. Buy a card from MyCiTi station kiosks or participating retailers. Load money on your card throughout your stay at MyCiti station kiosks or participating retailers to ensure you always have enough money on your card to travel during your stay. Your card comes with a pin, which you will need each time you load money onto the card. Please read the MyCiTi rules before getting a myconnect card. By accepting a card, you accept the rules. Papers, posters, and symposia that account for the resources, processes, and/or interventions that enable individuals to accommodate and/or transcend natural or human-instigated disasters and/or other potentially traumatizing events will fit well into this theme. We are particularly interested in the differential impact of protective factors and processes at low and high levels of risk, as well as in explanations that account for how contextual realities and cultural conventions shape resilience processes. Papers, posters, and symposia that account for the resources, processes, and/or interventions that enable individuals to accommodate and/or transcend hardships linked to unequal relations in roles, functions, decisions, rights, and opportunities will fit well into this theme. Papers, posters, and symposia that account for the neurological, genetic, epigenetic and/or physiological pathways associated with resilience, are what we are looking for in this cutting-edge theme. Contributions relating to the interplay between neurobiological, behavioral and social processes will be very welcome. Papers, posters, and symposia that account for how human and ecological systems interact in ways that prompt vulnerabilities, adaptive capacities, and resilience will fit well into this theme, along with comment on the complexity inherent in this dynamism. In addition, papers that speak to how communities can pro-actively facilitate resilience by changing the odds that threaten individuals and groups will be welcome. Papers, posters, and symposia that account for the social determinants of health, risk and resilience, and/or their complex interrelationship, align with this theme. Papers, posters, and symposia that account for how the family system enables/constrains positive adjustment to any form of adversity fit well into this theme. As above, we will welcome contributions that address the cultural, contextual and other complexities that shape this process. Papers, posters, and symposia that interrogate taken-for-granted research methodologies, and/or provide evidence of the usefulness of unconventional or cutting-edge methodologies, for researching resilience will fit well into this theme. As in preceding themes, comment on how context and cultural conventions influence the application of resilience research methodologies are welcome. The Child-to-Child Trust warmly invites you to participate in the second edition of the international conference on children's participation: CATS (Children as Actors Transforming Society).